There's no reason an interplanetary spacecraft would need a conning tower like a submarine, of course--but the way the Botany Bay sort of echoes a submarine somehow makes it feel like a plausible piece of near-future engineering...and, when placed next to the far-more-graceful Enterprise, it instantly testifies to the progress made between Khan's time and Kirk's. I was going to mention something along those lines--when I set my in-progress model next to one of my in-scale Enterprises the other day, I was amazed by that very thing. I had that model as a child. One of my brothers had made it, and I played with it constantly. Unsurprisingly, it eventually fell apart, but the one-piece glow-in-the-dark shuttle is still in my Lego box in storage somewhere. I, too, had the "Leif Erikson", tho I was somewhat past being literally a "child" when it was released! One thing that struck me at the time was how very different it was from the Enterprise, and not, I felt, in a good way. 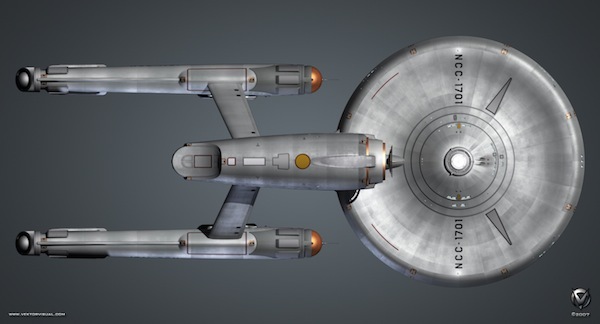 This design did not install itself genetically in my head (and those of other artists of my generation) as the Enterprise had, making it almost impossible to design a space ship without it being the "default setting". 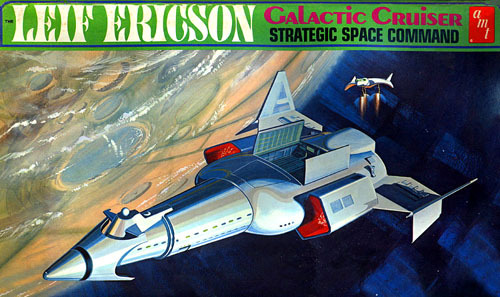 Years later I realized what made the Erikson "inferior" -- it was actually designed to be a plastic model kit. Its elements were all about molds and ease of assembly! I was very surprised to learn that the Leif Erikson was the ship Jerry Pournelle used as the basis of the INSS MacArthur in Mote In God's Eye. From reading the book, this was far from how I pictured MacArthur. My brother had the glow-in-the-dark version of this when we were kids. He had it hanging in his room by invisible fishing line, and the mini-ship would pop out of its bay on command (also by fishing line). 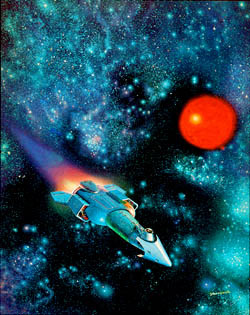 The Sternbach cover of Mote In God's Eye featuring this ship came out a few years later, and I thought "Wait a sec! I know that ship!" At the time, I thought Sternbach had used the model as reference, not knowing that Pournelle had used it himself and that the artist was being faithful to the author's intent until years later. Interestingly, this also applies to Jefferies' Klingon battlecruiser, which was created primarily because AMT wanted more TREK models to sell after the smashing success of their Enterprise. Less obvious with the Klingon, fortunately! So, I've been getting into work on my D-7 model, and it's got a number of areas that need major surgery in order to look "right". The old AMT kit was super-accurate in terms of shape and proportions, since one of the two models built for TOS was pantographed to make the tooling for the AMT kit. However, the Polar Lights/Round 2 kit is off in some key areas. For starters, I cut the bridge pieces apart in order to shorten the vertical, domed cylinder that sits behind the bridge, and to shave down the upper and lower platforms so they're not so thick. I also began thickening up the main hull with pieces of styrene trimmed to shape--the stock kit's hull isn't as beefy as the original. The hardest part will be cutting the nacelles off of the pylons and reattaching them at the correct--and more aggressive-looking--angle. Kinda glad Round 2 is supposed to be repopping the AMT D-7 in 2011. Missed out on getting that aftermarket corrected 1/1000 D-7 Bridge and Boom Neck that was offered on the SSM store earlier this year. The area with fwd torpedo launcher looked problematical during my earlier test fits of the Command section (model is now back in the closet due to busy X-Mas schedule). I considered--and missed--that replacement piece, too, but no biggie. My way is more fun! Speaking of that forward torpedo launcher (which appears to have intended as a navigational deflector/sensor comparable to the Enterprise's, but later became a torpedo tube in TAS and TMP), I just installed mine. By filing and wideining up the hole in the two pieces of the "head", and gluing the inner tube flush with the outer surface, this makes the filling and sanding much easier! Can't wait to see your photos, Greg! That's the fix I read about on the Starship Modeler Forum awhile back! Looking forward to seeing the finished product as well (been spending too much time in the Anime/Mecha section involving a certain other space franchise). You would also need a Sargon receptacle for that, wouldn't you? The kit would also be useful in building Flint's M-4 unit. Poking around in Google I found this shot of a fan-built (?) model of a Constitution Class starship I wish Abrams had paid attention to! Notice that it has extra "stuff" and weathering, but still retains the lines and, most importantly, the solidity of the original. Pretty sure that's one that I saw linked ages ago (in the lead up to the reveal of the Abramprise prior to "Star Trek" XI) that I liked very much. 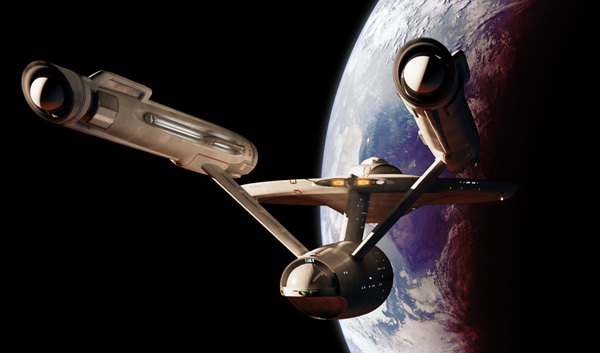 Some fan who goes by the online handle of Vektor put that together as his/her proposal of what the 'new' Enterprise should look like for that movie. It wasn't too bad at all - though I'm guessing that, like myself, you won't be thrilled that Vektor went with swept-back angled nacelle supports instead of Jeffries' original perpendicular ones. Odd that I get no sense of the backward angle in the image I posted! Applying STAR TREK's own internal "logic". the presence of the "antennae" on the fronts of the warp nacelles would mark this as an earlier version of the ship than what we saw on TOS -- even what we saw in "The Menagerie" -- so perhaps the more traditional pylons came later, as a move toward strengthening the overall structure. The smooth hangar bay doors would also support this assumption. * It speaks a lot, I suppose, to the impact STAR TREK had on my tiny brain that, 44 years later, I still have a detailed sense-memory of that moment! 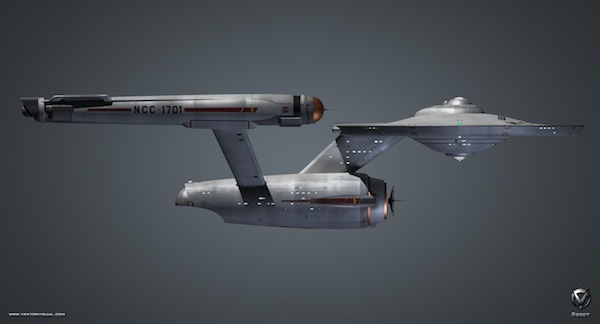 There is a huge wave of nostalgia that comes over me, any time I see any model representing the TOS (or approximate) vintage of the Enterprise. I am suddenly full of memories of picking up the AMT model kit for the first time, and discovering all sorts of "details" I had not picked up from watching the show. Those fly-bys were just too darn fast!! Hey! Yet another reason to be glad I am not on Facebook! Frankly, if the version above had been the actual Abramsprise, I might have given the rest of that stinkbomb of a movie more of a pass. That looks like a match. I don't mind the swept back pylons so much. Unlike TMP they don't add to the overall frail appearance of the ship. I don't quite see this "frail" element you've mentioned in the TMP version. While I agree that, from some angles, the pylons don't look as utilitarian as the originals (which met the hull at right angles), in profile (and other views), they look sound to me. Indeed, the overall Refit version is mostly beefier and more robust-looing than the original, pylons aside. Applying STAR TREK's own internal "logic". the presence of the "antennae" on the fronts of the warp nacelles would mark this as an earlier version of the ship than what we saw on TOS -- even what we saw in "The Menagerie" -- so perhaps the more traditional pylons came later, as a move toward strengthening the overall structure. 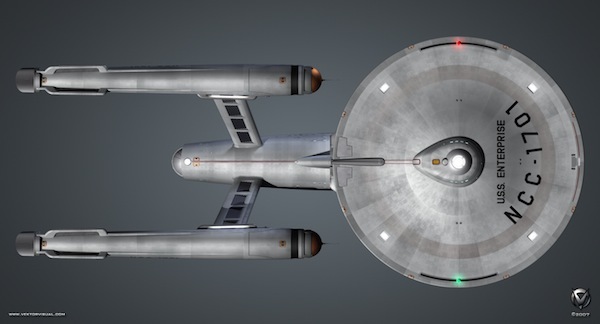 The original pilot version of the ship (as seen in "The Menagerie") had the nacelle antennae. Aside from that--and the smooth hangar doors--the CG model seen above leans mostly toward the production version of the original ship, with a few tweaks. If anything, this particular rendition would only really fit in-between the second pilot and the series, in terms of detailing (since it also has the black bands from the second pilot on either side of the upper saucer). Or, it could represent a post-series Refit which could supplant the TMP version in a TREK movie that was never made in the 70s! Anyhoo, I sawed off and reattached the D-7's nacelles at the more severe--and accurate angle. Still cleaning up the major seams. Now, the model looks much better (and meaner! ), since it has what I call the "clenched fists" look of the original model's nacelle/pylon arrangement.